ON NEW Year’s Eve, Prime Minister Narendra Modi announced that all pregnant and lactating women would be given Rs 6,000 under the maternity benefit scheme. According to the existing provisions, a woman can get the financial aid for two live births. However, following the inadequate Budget provision for the scheme, the Women and Child Development Ministry is set to limit it to the birth of the first child only. Moreover, while the Centre was earlier set to provide 60 per cent of the funds, it will now bear only 50 per cent of the cost, leaving the states to shell out the remaining amount. The Women and Child Development Ministry is currently preparing the Cabinet note for the scheme. “Following discussions with the PMO, we are in the process of preparing the Cabinet note for the implementation of the scheme. Considering the amount allotted for the scheme in the Budget, we have been told that the money should be provided to the mother only in case of the first child,” confirmed a senior ministry official. During his New Year’s Eve televised address, Modi had announced that the maternity benefit scheme would be extended to the entire country. The scheme, started by the UPA II government as Indira Gandhi Matritva Sahayog Yojana in October 2010, was being run on a pilot basis in 53 of the country’s 650 districts. Under the National Food Security Act 2013, the coverage was required to be made universal. Immediately after the PM’s announcement, the Ministry of Woman and Child Development had, in January, issued details of the scheme, stating that the Centre would provide 60 per cent of the funds for all pregnant and lactating women above the age of 19 years for up to two live births. But now, sources said the details are being reworked as the Budget provision is way below the funds required for implementation of the scheme in 2017-18. The Union Budget has earmarked only Rs 2,700 crore for the scheme. At 50 per cent cost-sharing, at the rate of Rs 3,000 per beneficiary, this would cover only 90 lakh of the 2.6 crore live births every year (latest available estimates as per the home ministry’s Civil Registration System 2013). “The Rs 2,700 crore that was finally allotted in the Budget for the scheme is much less than what the ministry had sought,” said sources. As per the government’s estimates, as stated in the report of the Standing Committee on Food, Consumer Affairs and Public Distribution (2012-13), the total annual requirement is Rs 14,512 crore. “At the rate of Rs 1,000 per month for six months, the scheme expenditure towards maternity benefits to 2.25 crore pregnant and lactating women works out to Rs 14,512 crore per annum,” said the Standing Committee report. According to the Sample Registration System 2011-13, Infant Mortality Rate in India is 40 per 1,000 live births and Maternal Mortality Ratio is 167 per 100,000 live births. In fact, India holds the record for the highest number of maternal deaths as per the UN Millennium Development Goals Report 2014. The maternity benefit scheme, meant to improve these indicators, releases money in three installments, provided that the woman goes in for institutional delivery and vaccinates the child. 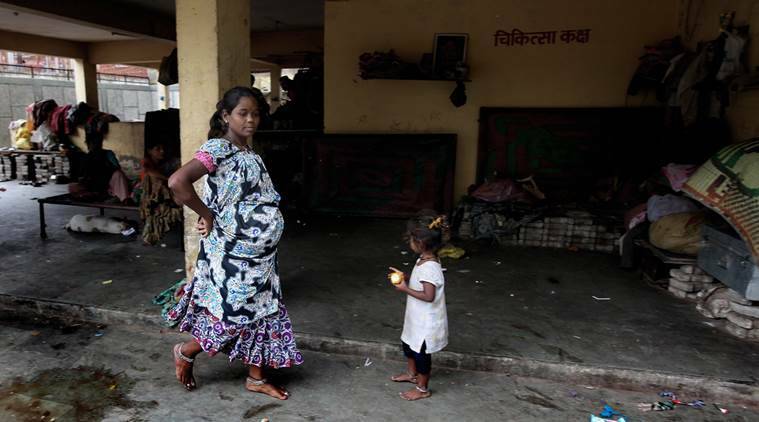 According to a study by the National Alliance for Maternal Health and Human Rights, the existing precondition of providing the aid only for two live births and those over 19 years of age excludes more than half the women, mostly Dalits and tribals.